Level: All Levels. Students must be at least 17 years old. This class will teach students how to set rough stones to their best advantage. 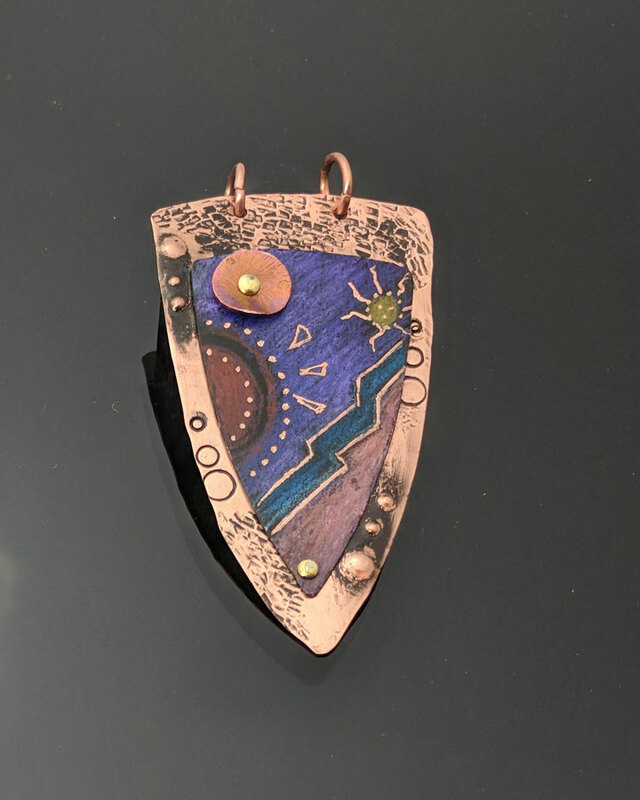 Students will learn a variety of skills, including how to solder, how to make a setting for very unusually shaped stones, stamping or texturing and how to make a bail that will enhance the pendant they are making. 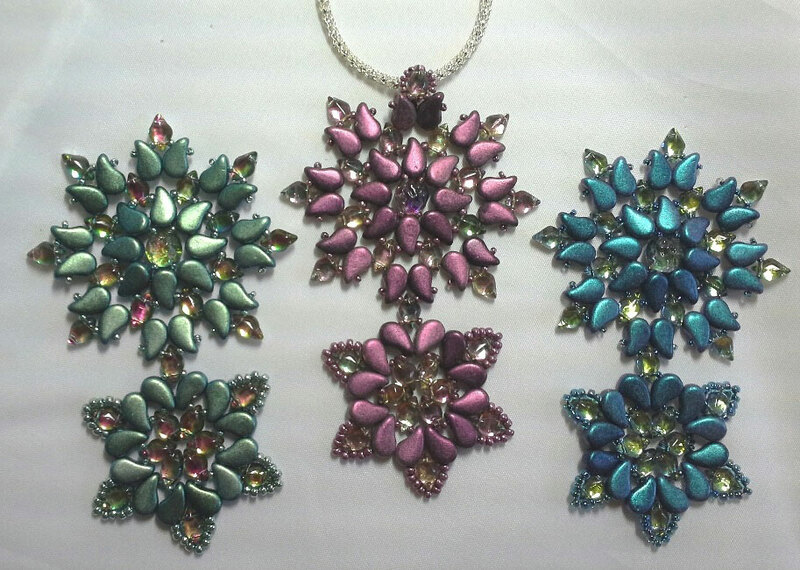 Various templates will be provided to copy for thew pendant shape or for inspiration. Willingness to use a small butane torch and have good coordination. Embellish an elegant Tila base with SuperDuos and seed beads to create edging that resembles peaks and valleys. Kit includes: Tila beads, half Tila beads, seed beads, SuperDuos, clasp, needle, thread and instructions. Braiding tiny crystal, counting the number to make blocks by the straight line braiding technique, aka Kusari Tsunagi, hook your favor charms to your bracelet! 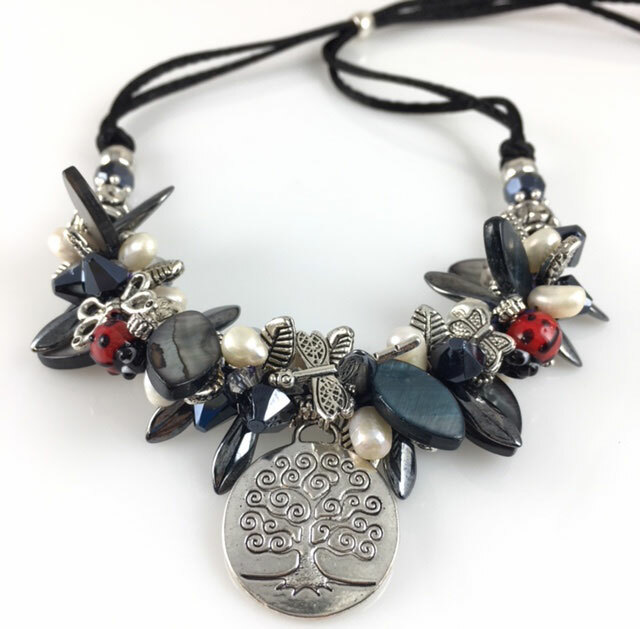 Fresh water pearls, glass beads, crystal, lamp work glass ladybug, silver butterflies dragonfly, tree of life beads and charms—lots of different size, shape, color beads, assemble together by 7-stand braiding aka Fill the Gap. The necklace is adjustable. 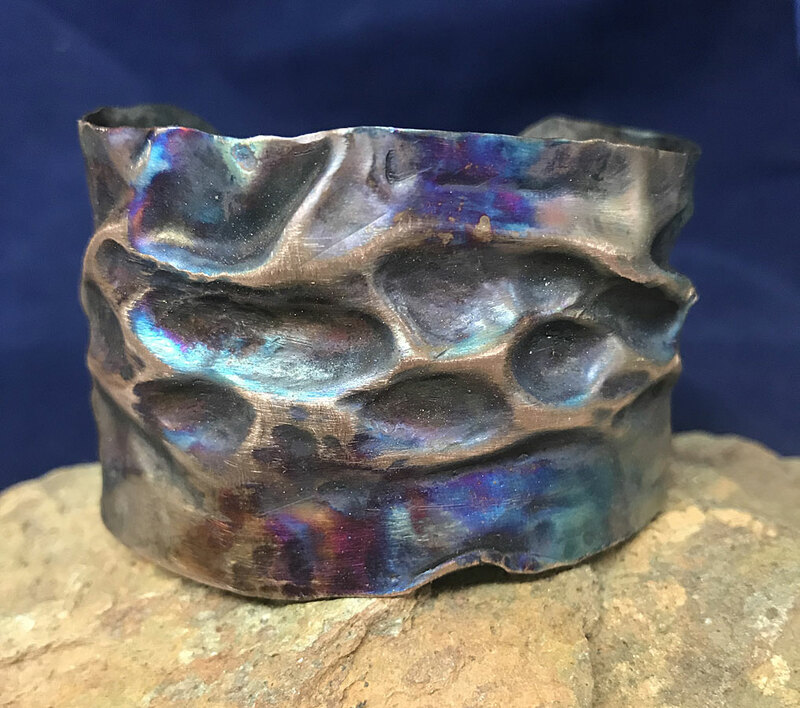 Skills and techniques taught: Air chasing (a fold forming technique using hammers and dapping punches), annealing, filing, sizing a bracelet to fit, flame painting. Students will learn the technique of air chased fold forming using either a butane or propane torch. They will be taught how to hammer amazing craters and peaks in a copper sheet. First students will cut to size a piece of copper sheet that will be formed into a bracelet to fit their wrists. Then they will file and anneal the metal, fold it and place it in a vise where they will use a variety of hammers and dapping punches to make the crates and peaks. 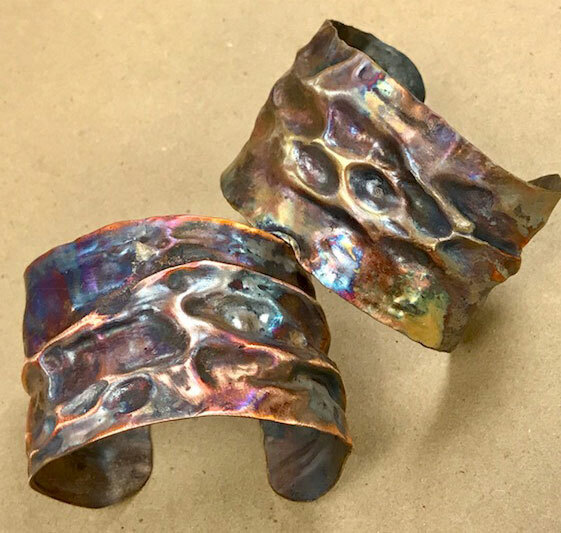 Finally they will open up the folded metal, finalize the shape and be shown how to produce wonderful flame painted colors on their finished bracelet. A sealant will be provided if the student desires it. Willingness to use a torch. Have the strength to do a lot of hammering. Level: All Levels, 12 years and up only. Calling all book lovers, artists, journal and of course jewelry enthusiasts to make and decorate tiny bound leather books. These precious books are not only for writing and decorating but wearing. Create adorable little books from genuine leather that open to workable paper pages. The tiny leather covered book necklace (apprx. 1.75″x 2″) will have around 6 folios, that’s 72 tiny pages! Three different binding stiches will be taught. Not only will you make the book but you can embellish the covers with leather burning, stamping or embossing. The instructors will take this even further and show you some mixed media options for decorating your pages inside. Finish your mini artistic books with closures, jump rings and chains for wearing. All tools will be available for use. 1 kit needed per participant, additional are available. 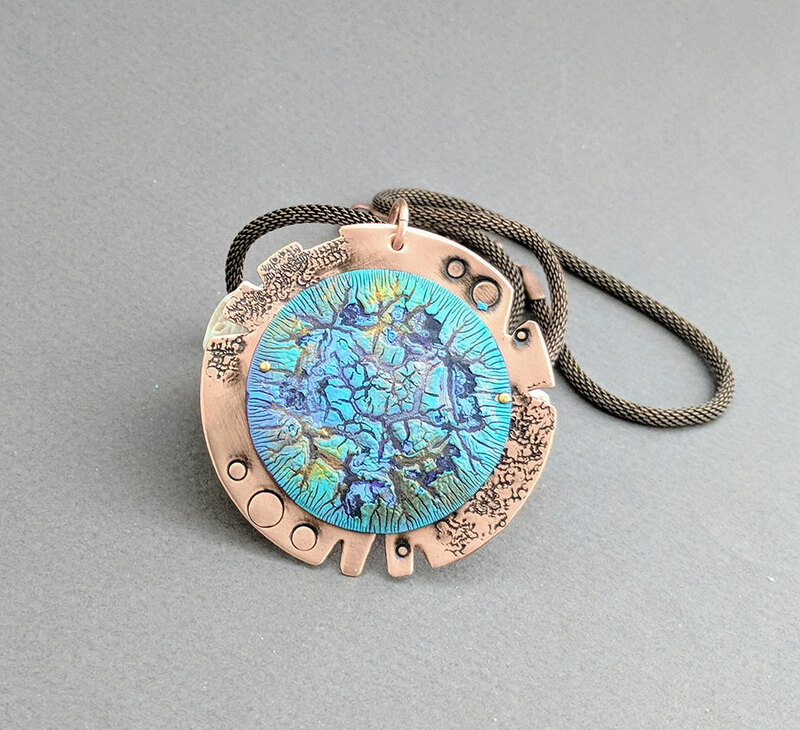 If you want to work colorful niobium into your jewelry designs, this is the class for you. 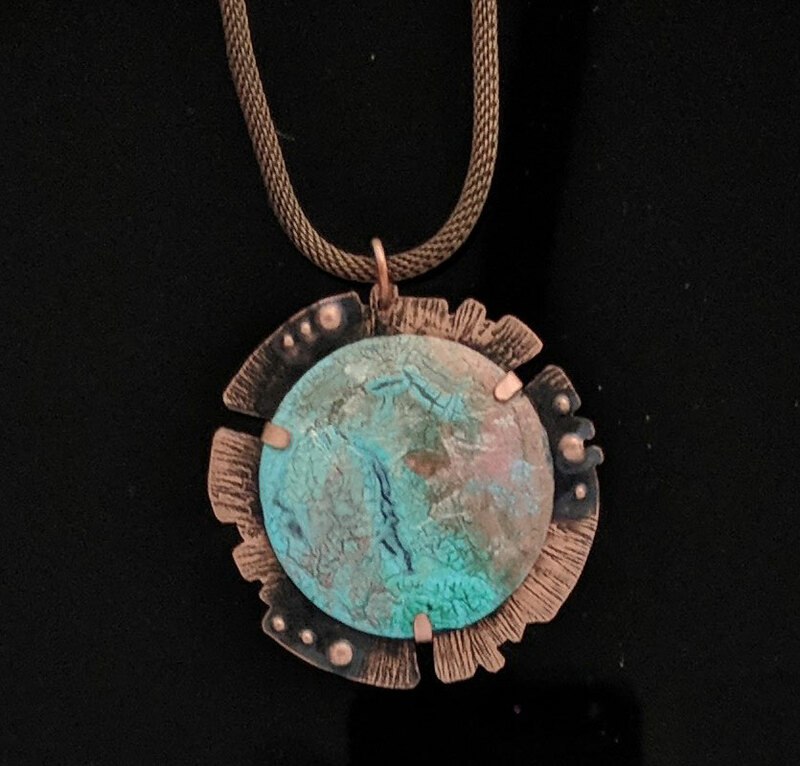 Learn how basic metalworking techniques can be applied to unanodized niobium wire and sheet. Then experience the magic as you take your creations and colorfully anodize them. Students will cut, drill, file, texture and sand niobium wire and sheet to prepare pieces for anodizing. Use seed beads and playful baby drops to embellish a lovely base of Tila and half Tila beads. Skills and techniques taught: Metal stamping, coloring on metal and design work. 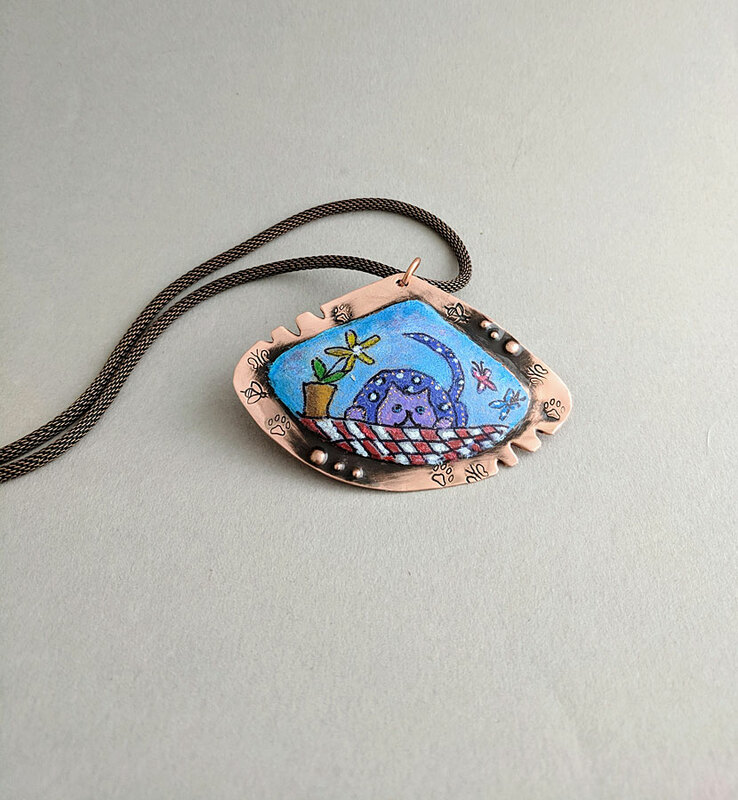 If you love a whimsical look and want to have fun making a pendant, this class is for you. You don’t have to know how to draw to make this fun piece. 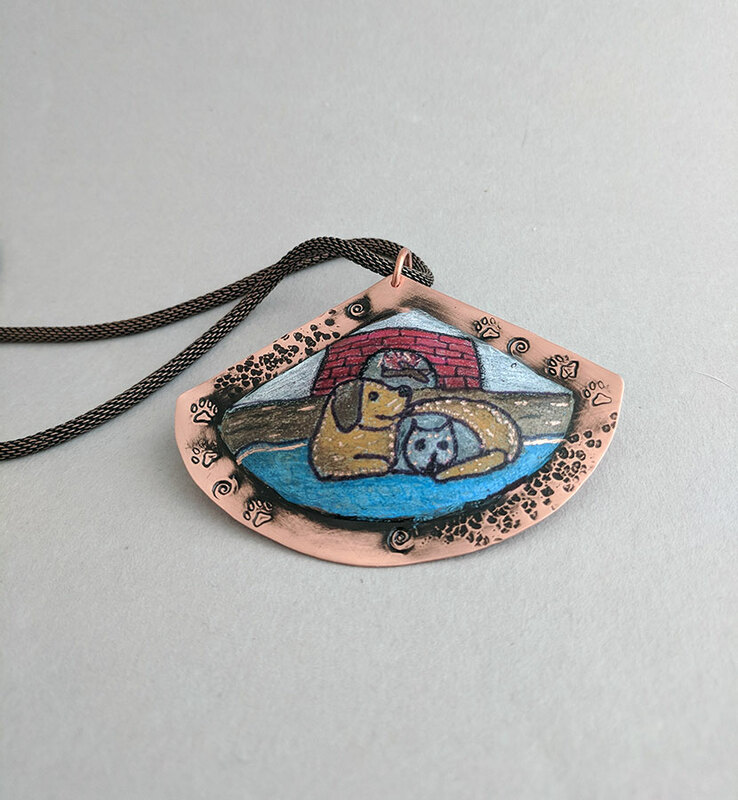 You will copy a design or use your own with my colored pencil on copper technique. Beginners as well as seasoned crafters will enjoy this class so no prior experience needed. 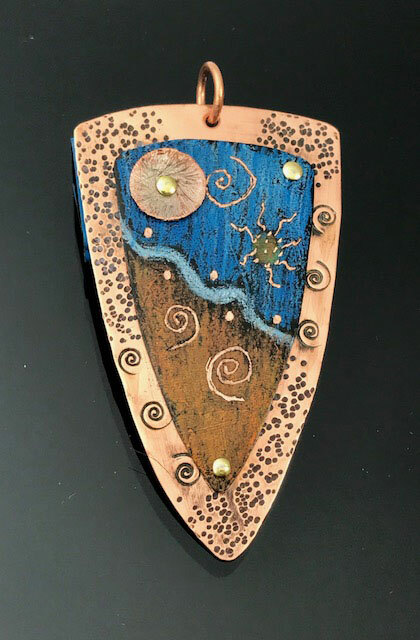 Kit includes: Pre cut and prepared copper piece, and the use of all supplies and colored pencils. Students should bring a 12 pack of Prsima Colored premiere pencils, teacher will have some to share. Skills and techniques taught: Sizing a ring to fit, soldering, filing, manipulating a torch to melt just the edge of the ring, using patina, burnishing to highlight. 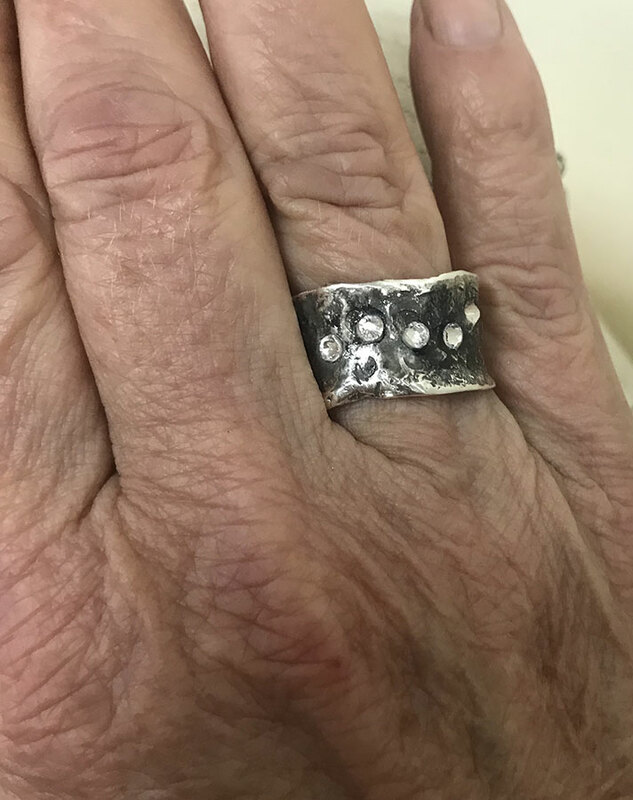 Students will learn how to make a dramatic ring using sterling silver sheet and either a butane or propane torch. 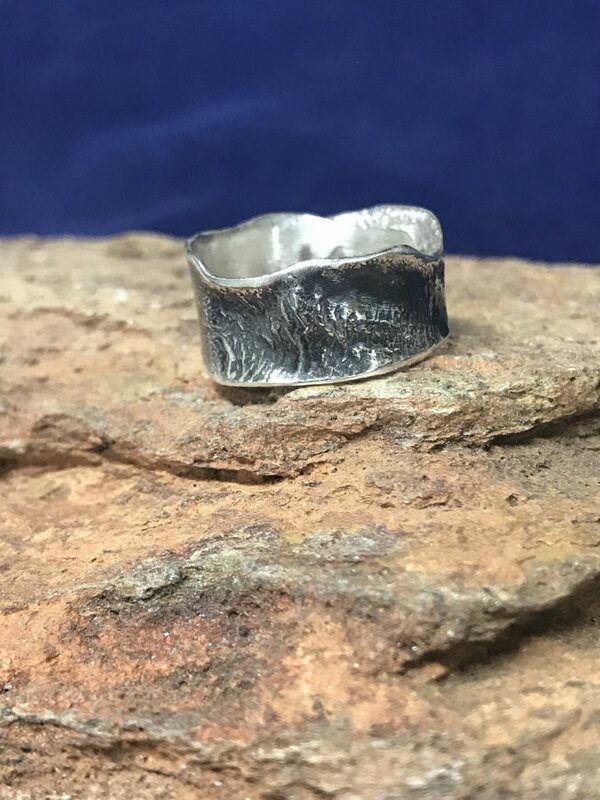 The teacher will instruct students how to melt just the edges of the ring after they have cut and soldered the ring to size. They will then patina the ring for interest and dramataic effect and highlight the edges by burnishing. Completed rings will be tumbled to give them a beautiful finish. Willingness to use a torch. Should have good hand coordination. Skills and techniques taught: Riveting, bail making, coloring metal. Come join us to create your own Spirit Shield using Roxan’s colored pencil technique. Create a design a design that will represent the essence of who you are using your own colors and design. 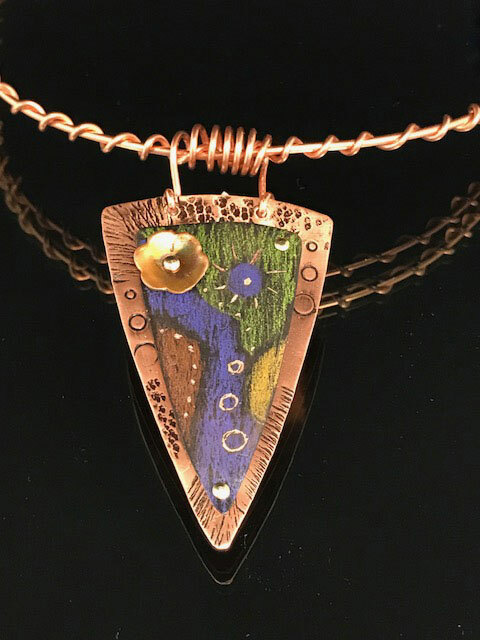 This piece is finished using rivets, fired discs and a coil bail that accents the angular design. Kit includes: All copper, wire, jump rings, rivets, and round disc. Students should bring bailing pliers, flat nose and round nose pliers, jewelry files, and Priemere Prisma Color pencils or share the teacher’s tools and colored pencils in class. You will chose or design a shape to cut out of unanodized niobium sheet. Prepare the shape by filing and smoothing the edges. The Sizzix Big Kick will be used to emboss your shape. Punch holes and anodize the shape with your favorite colors. Create dangles and bead links and finish your necklace with aluminum chain. Come join us for a fun day creating texture and color of your choice with crackle medium. This process is unpredictable and you never know what you will end up with, but it is always beautiful. 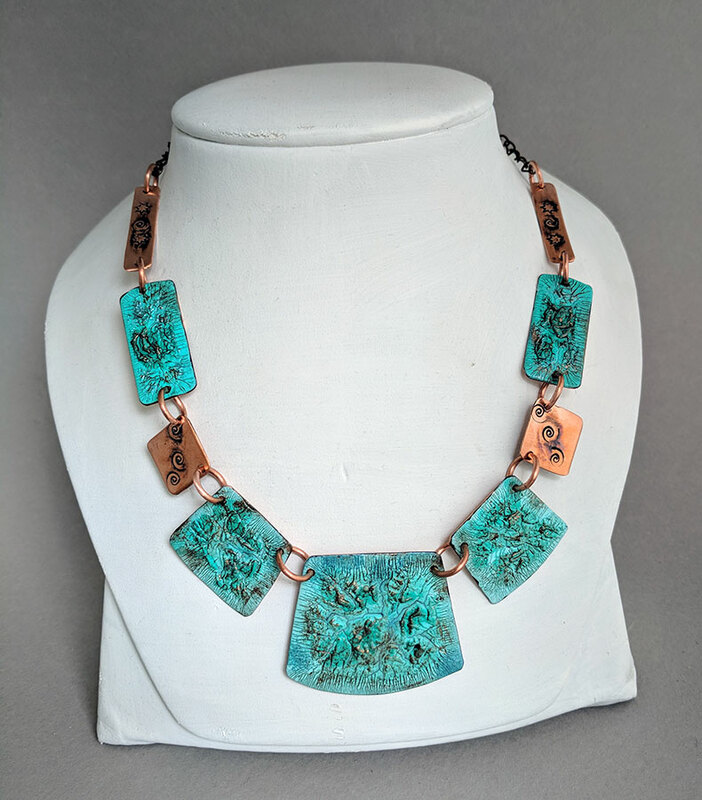 Students will set their piece in copper with copper jump rings and chain. 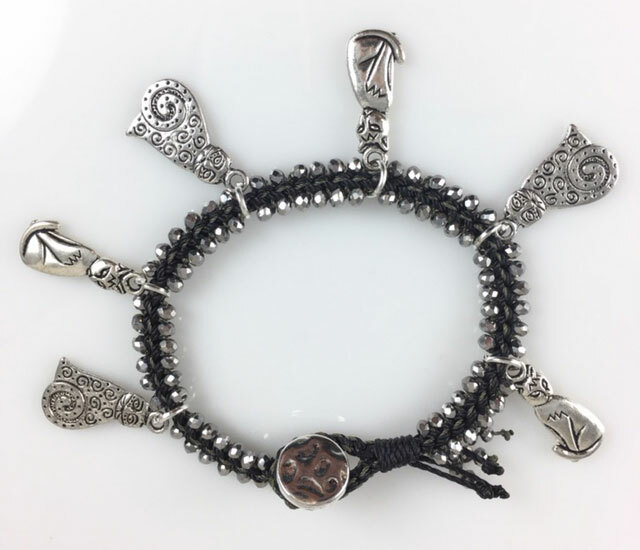 Kit includes: All metal pieces, jump rings, chain, medium, and clasp. Skills and techniques taught: Off-loom hand-weaving; testing & debugging electrical connections. This necklace has a hidden secret—a light-up focal bead! Learn to install an LED strand and weave leather tubes to cover the wires. Demonstrations of design principles including choosing a focal bead, installing the LED, and creative ways to cover the wires. Make and test electrical connections and gain confidence in assembling LED necklaces, with plenty of time for questions. Multiple colorways available. Project completion may require 1-2 additional hours. Bring AnglerFish Power Clasp, or purchase from instructor. Kit contains: AnglerFish LED thru-strand and end kit, 18″ silicone tubing, 12″ copper wire mandrel, 30′ leather cord, 4 cord end caps, choice of 1 focal bead, 2 teardrop beads, bead caps and spacerbeads to complete 1 necklace, complete instructions. Working with small parts & strong magnets, moderate hand flexibility & strength for weaving. Task light and magnification as needed for small parts, bead mat, AnglerFish Power Clasp (or purchase from instructor). Optional: flush cut, crimping, round-nose & chain-nose pliers,notebook & pen, focal beads from your stash for illumination (with holes 2mm or larger). 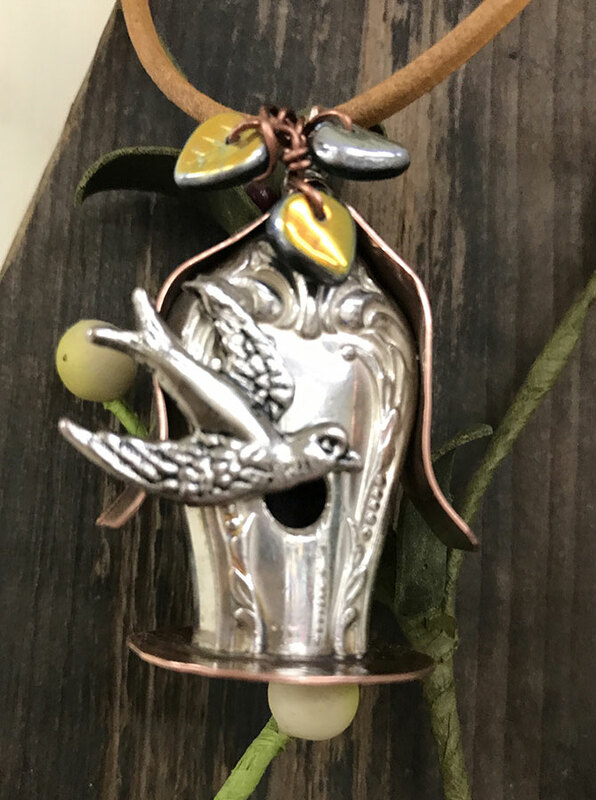 Students will make a delightful birdhouse using a hollow handle sterling silver plated knife and sterling silver, copper or brass for the roof and pendant base. 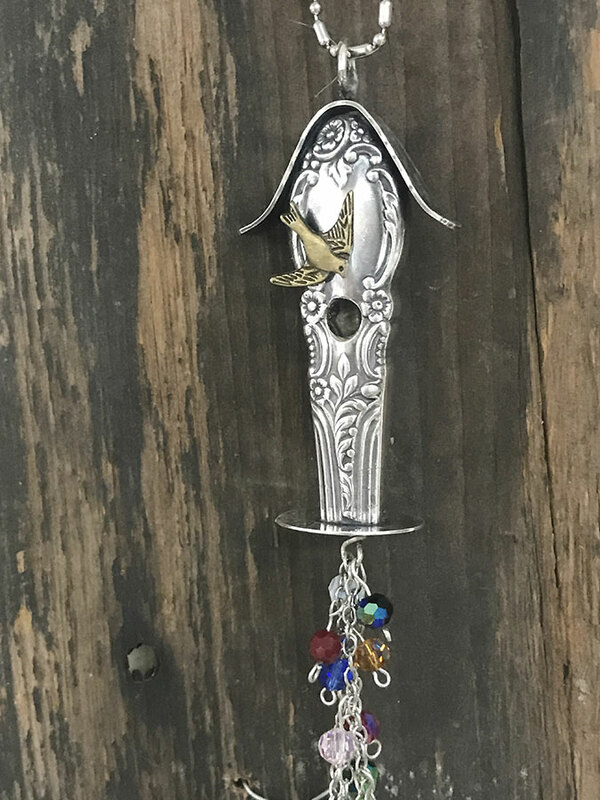 They will drill a hole for the birdhouse entrance, texture and solder the roof and base to the knife handle, solder on the jump ring bail, then add a bird charm, chain and beads to accent the piece. Willingness and ability to use a torch and drill. Good hand coordination. 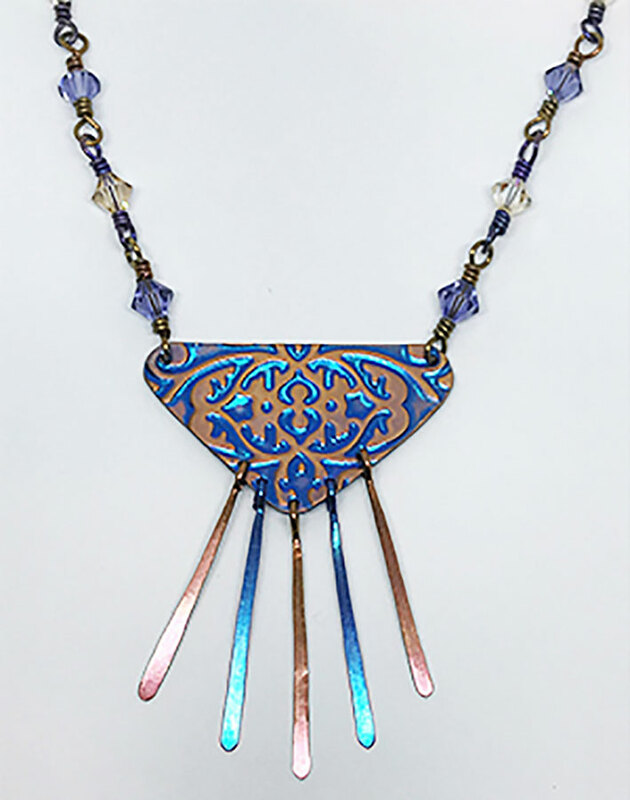 Create a component necklace using 2-hole Paisley Duos plus GemDuos and then embellish with seed beads and 2-hole baroque cabochons. 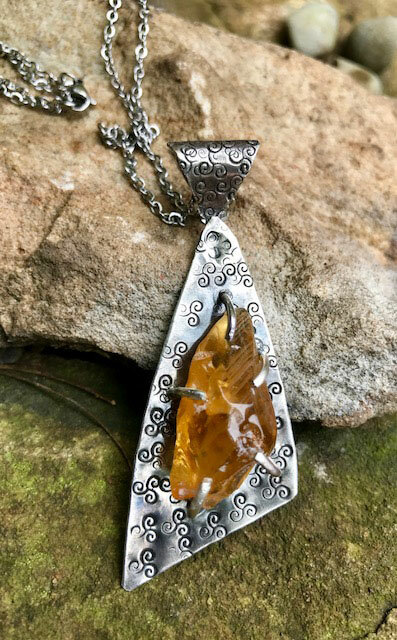 Finish the pendant with a flourish by suspending it from Silver Silk, a beautiful woven wire chain. Kit includes: Paisley Duos, Gem Duos, Baroque cabochons, seed beads, Silver Silk, findings, needle, thread, and instructions. 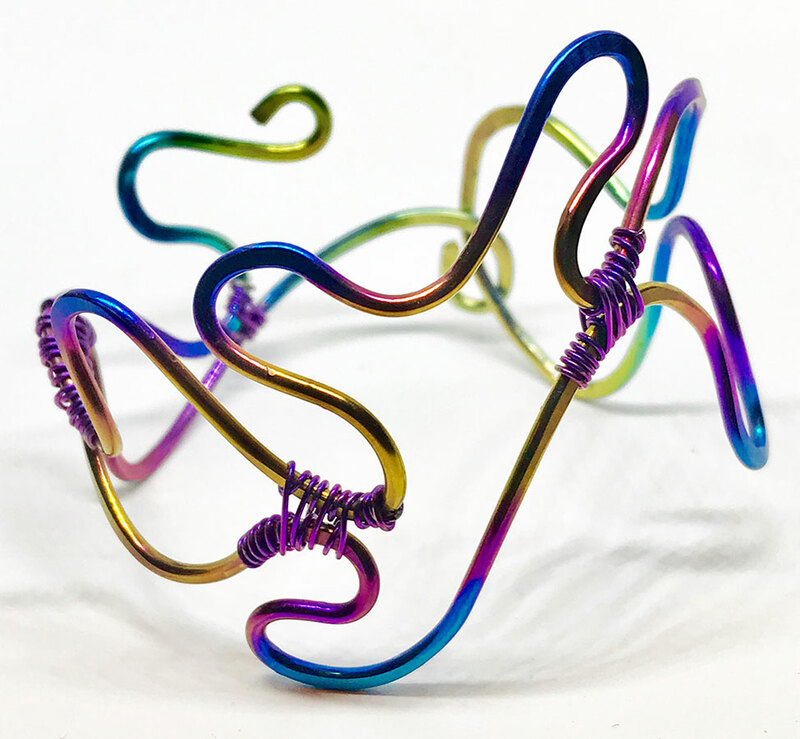 Beginners will feel comfortable in this class as they bend and forge niobium wire to create a removable wrist tattoo. As in all of Marti’s classes, the color choices are up to the creator as they anodize their bracelets. A small bit of wire weaving stabilizes the two sides so there is no movement when wearing. This project only takes basic tools to create. And if a beginner student does not have them, the teacher will provide them. 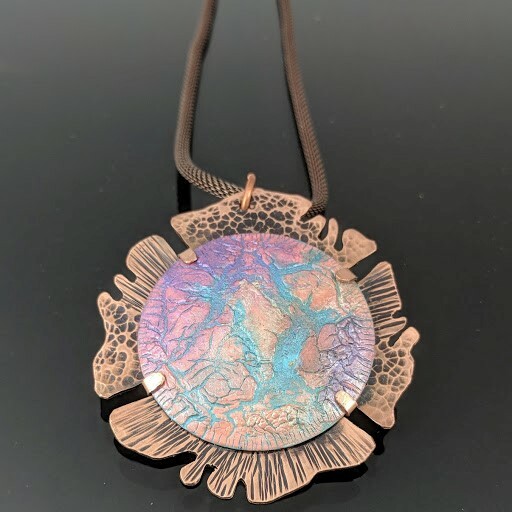 Explore the fundamentals of brass and copper acid etching while creating your very own customized book pendant. Make decorative reliefs on 1” x 1.25” metal blanks for a front and back cover by transferring either stamped, illustrated or printed digital images. Stamp phrases, short quotes or poems on thin metal blanks for the interior pages of the book. Spiral bind your custom mini book and turn it into a fabulous pendant. Add more pizazz by finishing the pendant with a chain and embellishing it with decorative beads and charms. 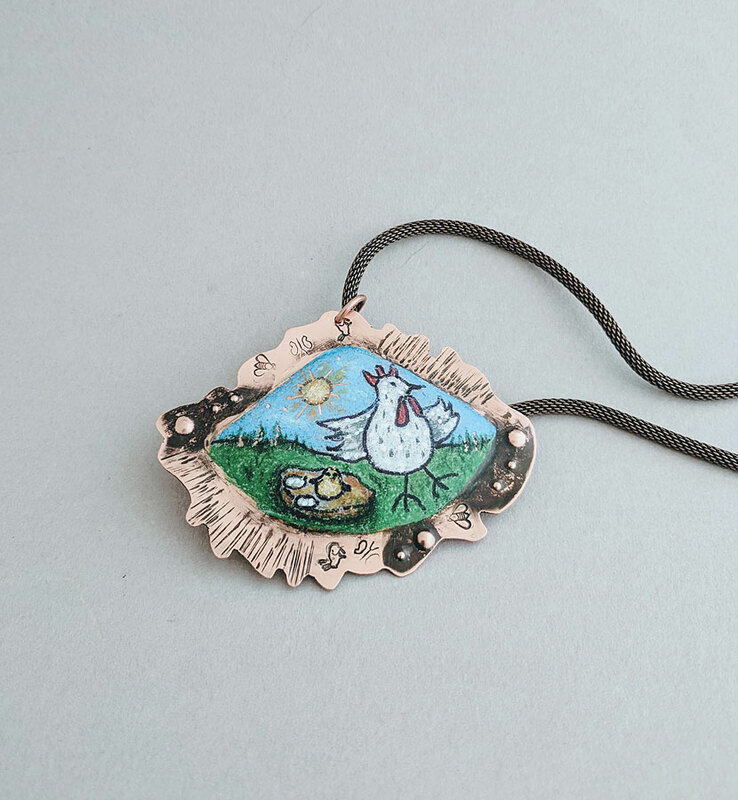 Leave with a beautiful ready to wear book pendant! Tools will be available for use. 1 kit needed per participant, additional are available. Skills and techniques taught: Riveting, stamping, sawing, working with texture medium. Come join us for a fun time creating texture and color with crackle medium. This process is random and you never know what you will get but it is always beautiful. Students will set their piece in copper so bring your jewelry saw. If you have no experience with a jewelry saw you can rivet your piece to the copper and stamp the edge. The pictures are just a sample of what you can be done with this exciting medium. Kit includes: Copper pieces, crackle medium, rivets, jump rings, patina and the use of all tools. Create a lively kinetic pair of earrings that express your uniqueness in color. Cut your shape, texture with hammers and stamps and then anodize with your chosen colors. 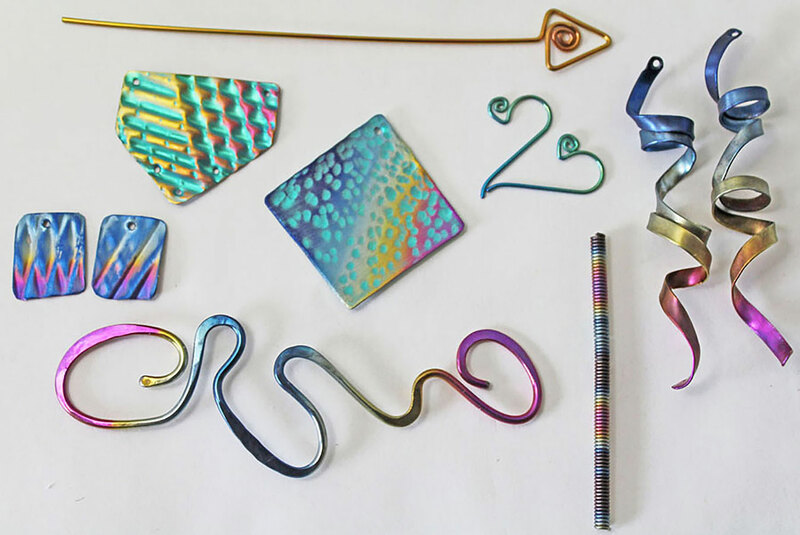 Add a colorful dangle that you bend, forge and anodize. 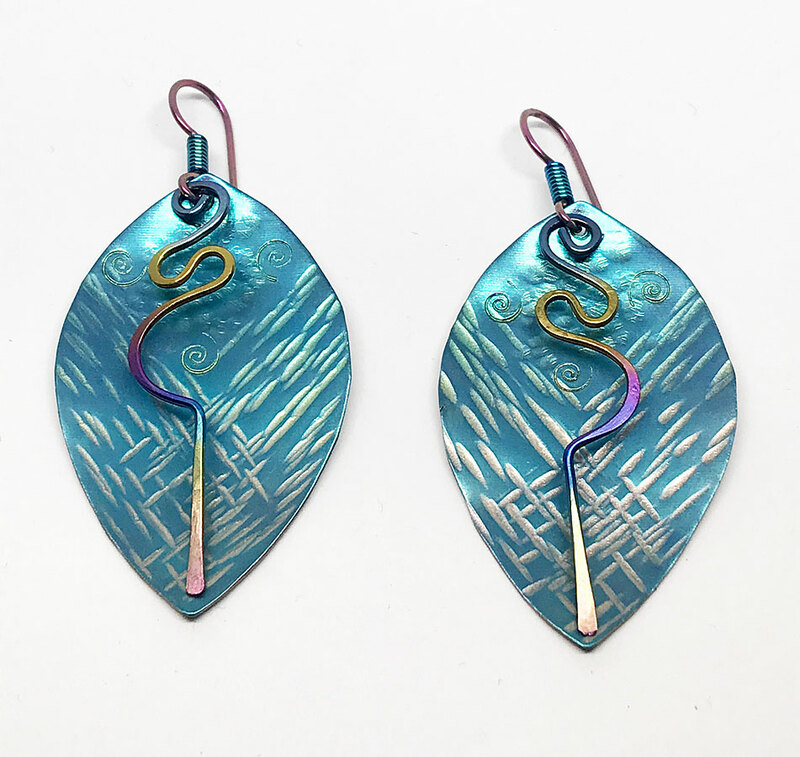 Attach anodized earwires and leave class with your own statement earrings. 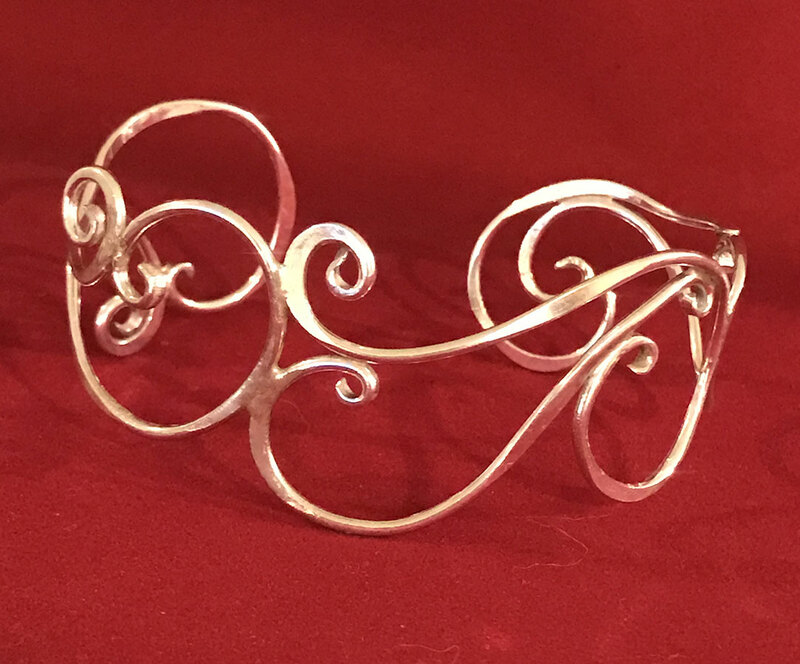 Skills and techniques taught: How to make graceful sterling silver wire swirls, soldering, hammering. 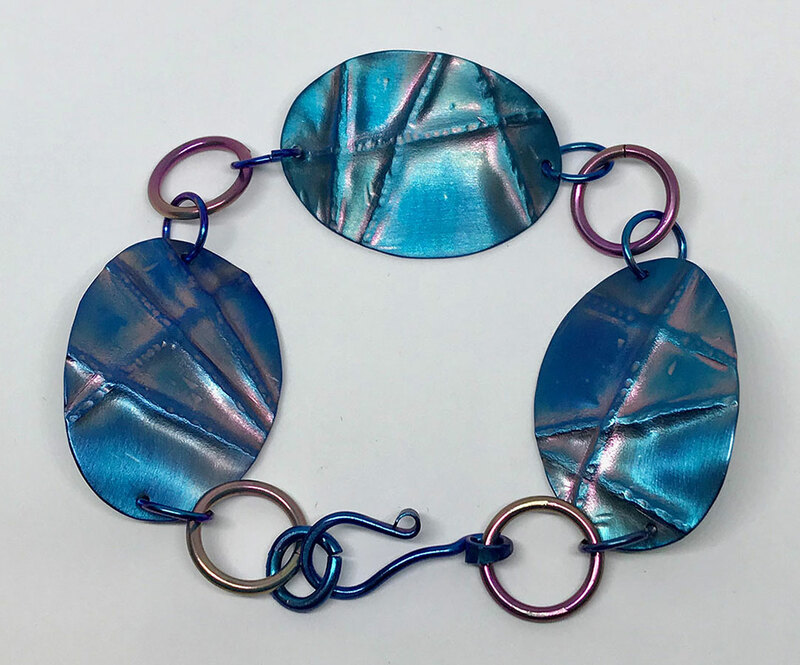 Students will learn how to form graceful swirls from sterling silver wire and solder them together to make beautiful bracelets that they can wear for any occasion and with any fashion style from jeans to ballgowns! The instructor will provide a detailed a template for students to follow to assist them in achieving a gorgeous end product. Suitable for beginners and seasoned metal workers. Willingness and ability to use a hammer and torch. Good hand coordination. 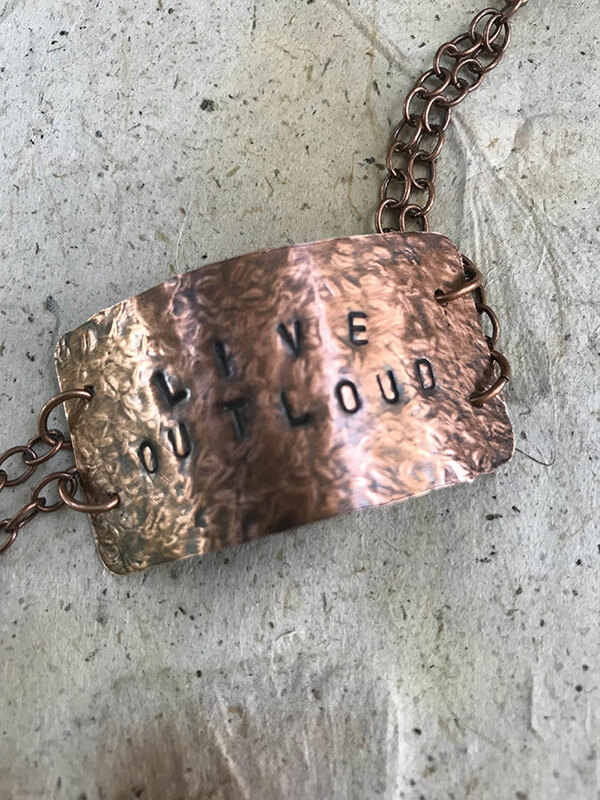 Learn the basics of hand stamped jewelry in this 2-hour workshop. 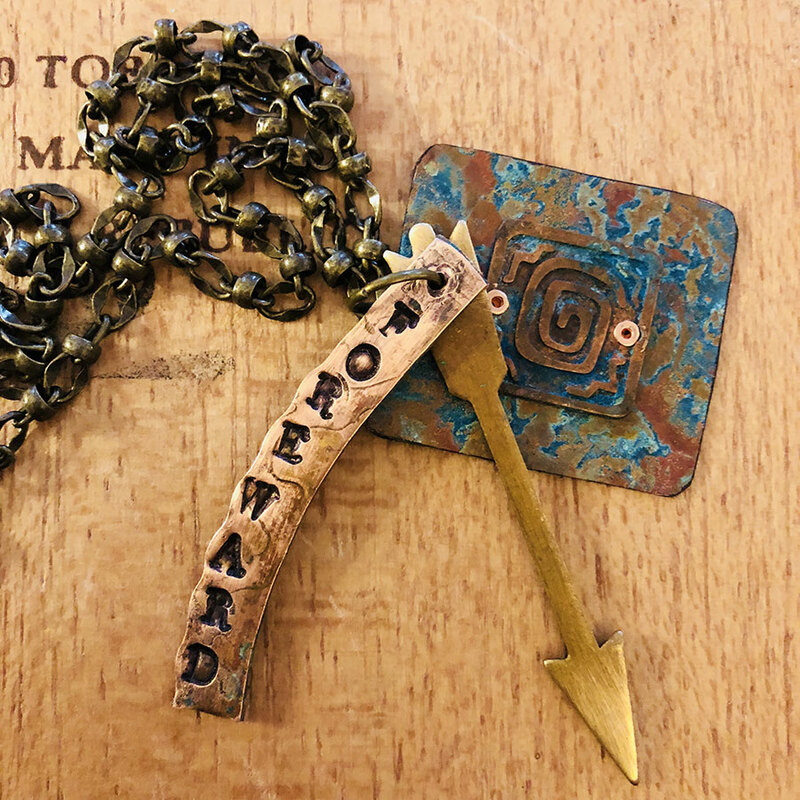 Gather, stamp, assemble and create a one-of-a-kind charm necklace celebrating empowerment. Honor your unique strength and independent spirit! Each kit bought for the workshop will be put together by you from our jewelry bar. Pick 6 metal blanks, 26” nickel free chain, 1 clasp, 10 jump rings, 4 eye pins, 10 beads or decorative findings. We have a variety of metals for your pendants. All tools and stamp sets will be available for use. 1 kit purchase necessary per participant, additional are available. Be inspired, inspire others and get your message out! Use two-hole SuperDuos and seed beads to make a series of components that are then combined to create an elegant bracelet that’s perfect for a night on the town. Kit includes: SuperDuos, various seed beads, clasps, needle, thread and instructions.